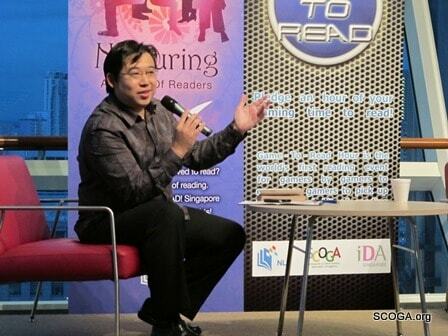 The Game 2 Read (G2R) Book Club, created especially with video-gamers in mind, was launched on 21st August in Singapore at The Pod of the National Library Building. 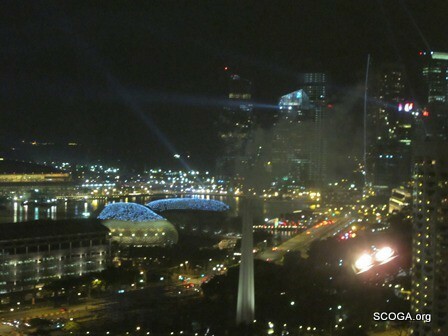 The venue, positioned high in Singapore’s skyline, set the mood for the book that was discussed: StarCraft #1: Liberty’s Crusade. As the sun set and the stars came out to play, it felt almost like The Pod was really a battlecruiser in the limitless, star-dotted endlessness of space. What a view! We also had fireworks, courtesy of (we think) the YOG. Liberty’s Crusade was discussed in detail to an audience of approximately 30 people. Attendees were a diverse bunch and included regular National Library Book Club members, sponsored gaming teams and even a member of celebrity girls’ DotA team, PMS*Asterisk. The discussion was facilitated by chairman and co-founder of SCOGA, Nicholas Aaron Khoo. 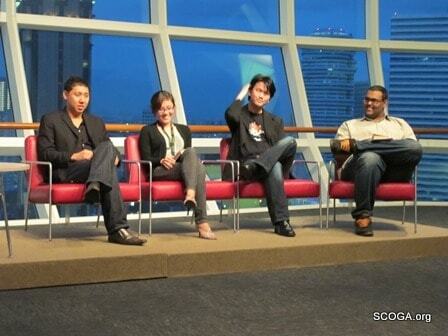 Our panelists, L – R: The “charming and charismatic” Eugene, Mary-Anne, Keith ‘Shade’ Lim and Divahar ‘Drakorin’ Chitra. Questions such as ‘how would you feel about working with the murderess, Emily Swallow’ and ‘could you have justified working for the very government that destroyed your family’ were posed to the panel, made up of tabletop gamers to old hands of the esports scene. The discussion was not confined to the book’s content either. Answers ranged from an analysis of Stalin’s infamous quote – The death of millions is a statistic – to the Yellow Ribbon Project. Unlike typical book clubs, the G2R Book Club will not be discussing the latest bestsellers of the month. It has its members’ interests at heart instead; the books read will be related to game universes. That does not mean the book club will be perusing manuals and guides. They will be reading stories set in popular canons such as World of Warcraft and StarCraft, and bestseller lists will do nothing to influence their choices. The club has not yet decided on next month’s book, but it is rumoured to be one from the Diablo universe. Interested in joining us for the next discussion? or perhaps you just love Diablo. Whatever it is, be sure to drop us a note at info@scoga.org so we can keep you updated! A big thank you to the NLB for working with SCOGA to launch this book club for gamers!